Welcome back indeed, Brian Roberts. The Orioles second baseman made his long-anticipated return last night against the Pittsburgh Pirates, and he did not disappoint. In his first at-bat, leading off the bottom of the first inning, Roberts had a vintage BRob-type AB. He worked the count to three-and-two, and on the sixth pitch he saw, laced a line drive to center field for a single. It was great to see not only because it was exactly the kind of AB we’ve come to expect from Roberts over his Baltimore career, but because without him in the lineup, there has been pretty much nobody on the team who even attempts to make the pitcher work on a regular basis (an even more glaring weakness with Nick Markakis temporarily out of the lineup). His second AB was more Robert Andino-like than Roberts-like, as he struck out on three pitches. Following that hiccup, though, it was more good from Brian. He singled in his final two official AB, the second of which came hitting from the right side, and added an RBI sacrifice fly for good measure. Roberts’ final line: 3-4, 3 singles, 1 RBI (somehow he never managed to cross the plate, despite the 2-3-4 hitters in the O’s lineup going a blistering 8-15 with 5 RBI). Click here for video highlights from MLB.com. It was a performance that fans – and Roberts himself – will not soon forget. Following the game, Brian admitted that when he first stepped to the plate to a standing ovation from the Oriole Park at Camden Yards crowd, he was a little more “emotional” than he expected to be, and had to take a moment to compose himself. Listening to him speak in the post-game press conference, it was tough not to get emotional ourselves as fans. “I actually got a little more emotional than I thought I was going to,” he said. “It took me a second to gather myself. It was very special and much appreciated. That’s for sure. Everyone has been so good to me here in my career. The fans have been so great and supportive of me the whole time. That was very special. Let’s not forget – this is a guy who, as recently as last fall, couldn’t even walk his dog or take a trip to the grocery store without becoming dizzy and nauseous. While we will all hold our breath every time Roberts slides hard into a base or makes a diving attempt at a ground ball for the rest of his career, for one night at least, Brian looked like his old self, and gave O’s fans hope that he’ll be able to finish out his career in B’More on his own terms, as the productive and professional player he has always been. And what did the guy he replaced in the lineup, Andino, think about B-Rob’s return? Kidding, of course. After the game, Dino gave Roberts a big ol’ bear hug in the hand-shaking line. Anyway, despite Roberts “taking Andino’s job,” Robert should be given the opportunity to start at third base more often than not moving forward. Wilson Betemit can’t hit his way out of a wet paper bag lately, and last night he misplayed a pop-up that led to Buck Showalter inserting Andino – who had been on the bench – at third. As Roberts discussed his play on the field directly after the game with the MASN booth, O’s fans knew what was coming – a shaving-cream pie in the face, most likely from Adam Jones. After some of the shaving-cream punches we’ve seen Adam deliver this year though – I swore he damn near broke Nick Johnson’s nose a month or so back – we were hoping AJ would take it easy on B-Rob. The O’s attempt to take the series from Pittsburgh tonight – in what would be their third consecutive series win – but their starter for the game is currently up-in-the-air after Brian Matusz took a foul ball off his nose yesterday during a bunting drill. Stupid interleague play. 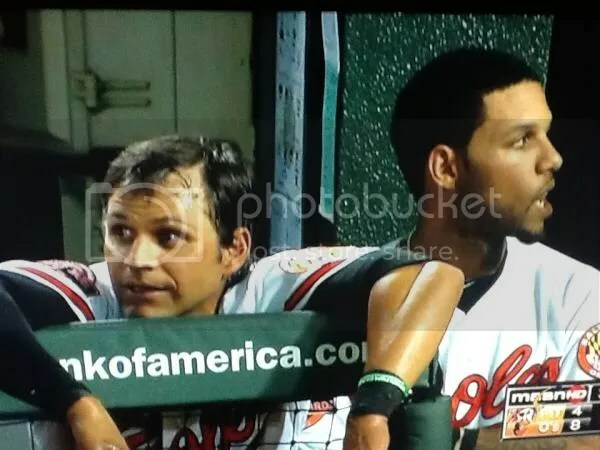 This entry was posted on June 13, 2012 at 7:47 am and is filed under Orioles. You can follow any responses to this entry through the RSS 2.0 feed. You can skip to the end and leave a response. Pinging is currently not allowed. Man-crush BRob gets special attention.